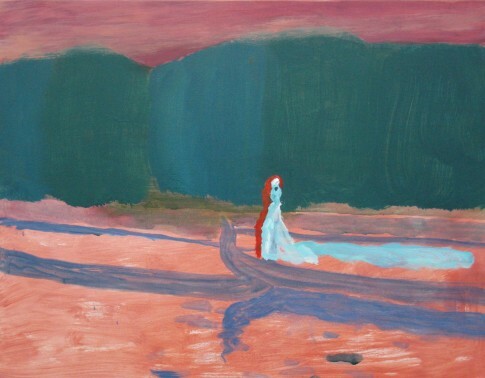 Yvette Greslé talks to Eleanor Moreton about her paintings and her influences. Yvette Gresté (YG): Painting is a medium so burdened by history. What does painting mean to you? What do you think are the possibilities of painting today? Eleanor Moreton (EM): In some ways the huge burden of painting, its historical baggage, has been part of its attraction for me. Maybe that’s not a good thing – a bit like being trapped in an obsessive, over-analytic relationship. It seems to be difficult to speak beyond that history. From talking to other artists; there are some who can’t stand the weight of painting’s history and turn to other, fresher ways of making art. I’ve incorporated painting’s history into my subject matter and the way I work for a long time. But at the moment I’m wondering how heavily or how lightly this should be carried. Physically, painting is an extremely simple idea, but conceptually it is not. At its heart is the mystery of depiction. I am interested in the significance of pictures and the way we relate to the painted picture (as opposed to the moving picture or the photographic picture). I deliberately use “picture” here as opposed to image, which is the more contemporary word. YG: What interests you about the process of applying paint to a surface? EM: This process has, essentially, a visceral pleasure for me. More than that: it’s a sort of need. The process is very similar to dancing and when things are going well it’s intuitive. Beyond that, I think for a long time I was preoccupied by a curiosity about how you can extend your language or your steps and I was often exploring things that felt very un-natural. Which is useful I think, but can lead away from something potentially more important. Although I’m not sure yet what that is. YG: Do you draw on particular histories of painting? EM: I make allusions all the time to other paintings. When I was growing up, looking at paintings and reproductions of paintings was so pleasurable; it was unlike all the other hard things we had to do. It’s always extremely difficult for me to break through an existing painting and find something of mine in it. I have to trust that there is some value in that endeavour, even when I don’t make much headway. I think I’m as interested in why I fail to break away from a source as I am in succeeding. I recognised some time back that my attempts to impose myself on a pre-existing image is part of an on-going struggle to find a wider personal autonomy. YG: What kinds of painterly mediums and surfaces interest you? EM: I’m not interested in pursuing technological developments or material experiments for their own sake, although that is a way to move painting into another place, make them look different. I’m not exploring the object nature of painting. In some ways I like to see how far I can go with very little variety. I have always enjoyed using oil paints because of their luxurious, sensuous quality. I like using watercolours, although they take some getting used to. They don’t forgive like oil paints do and quickly become distressed. They need a sort of bravado confidence that I’m always surprised by. I like a smooth surface and use as smooth a canvas as I can. I love working on board and have worked on card intermittently. I’m really enjoying the current cardboard pieces. I think I must really love that brown cardboard. I love the colour and feel quite excited when I find a box at work and bring it home. YG: What role does colour play in your work? EM: Colour is hugely important. About 8 years ago it came to me that I really didn’t know what I was doing when it came to colour. I was astonished that I’d never learned anything about it in all my formal studying. I actually think the English don’t register colour as important in painting. We understand the value of drawing. But only drawing as a way of understanding space. Working with colour requires something else – a huge conceptual adjustment that you can see in Matisse. It’s a subtle but seismic shift. I don’t go there, but I know where it is. Just the decision to start considering colour as of primary importance, and practical measures, like mixing paints very consciously, has led me to a better understanding and wider options. YG: You work with so many different kinds of sources: from personal memory to media text. What happens creatively and conceptually in the space between source and finished work? EM: Well, good point! I can’t pretend that my sources are not important. They are hugely important, though not in a didactic way. They drive my painting and maybe more than that. Maybe I even want to put questions into the public realm. How do you let the painting have its head, as well as keeping in touch with your source? For me each piece negotiates that afresh and at different times in our lives we favour a different emphasis. It isn’t a process which quietly unfolds (like a thought which becomes a series of ever developing drawings, concluding in a painting). It’s more scattered and sparky, with conceptual connections popping up at odd times and paintings that make themselves and then reveal themselves (some time later to have meaning). Sometimes it feels like I’m in that chariot race in Ben Hur. One way I think about it is that there are a number of formal things I want to find out about and there are a number of external sources that I want to talk about. And I try and bring those together in a way which deals with both, rather than neither. YG: How do you use your medium to speak about contemporary issues? Is there a politics to the process of painting? EM: I think it’s very hard. The rhetoric around abstraction, probably traceable to Clement Greenberg or earlier to Roger Fry and Clive Bell, has lingered on to become the rhetoric surrounding all painting, figurative or non-figurative. Content has become the thing nobody wants to own. And it’s difficult to know whether we can make good, interesting paintings that are not simply talking about themselves. It’s certainly very risky to try to speak beyond the materiality of the painting, because usually when we try to do that, what we say or make ends up looking banal. It’s something I’m thinking about a lot at the moment. YG: To what extent is your relationship to painting influenced by the geographical space you occupy? I’m interested in histories of painting from around the world. And also in the extent to which the medium exists not only in relation to history but also to geography (or perhaps more specifically to place). EM: My initial thought is that it’s part of being a studio painter that you engage with the world in a mediated way. So geography exists primarily in my imagination, in the same way that history does. But then I realise that there is a two-way relationship: I dream about place, then I visit it, then I return and the dreams I have next find their way into paintings. But I think the whole process is usually initiated by something fictional. Words like Baltic and Hanseatic trigger reveries. There is a cluster of locations, mostly Northern and Central European, Germanic, Nordic or Slavic that started in my imagination, fuelled by reading, listening to the radio and films, and became real by visiting them. I did many Hapsburg paintings. I think the first one may have been called Hapsburg Hat and it started from a short visit to Madrid. It was really hot and I spent my daytimes in the Prado. I came across a Velazquez painting of Philip IV and he was wearing a little hunting-type hat. There was also a beautiful dog in the painting. I suppose it may be something to do with the scale of Velazquez’s paintings, but wandering about in those windowless rooms amongst larger than life characters, after a while you are transported. When I was a schoolchild the first schools’ television programme I ever saw was called “People from Many Lands”. The first episode was about Gozo. When I saw the television programme I felt very excited. How amazing that being at school could be so interesting, but also how amazing that the world contained places like Gozo. I visited Gozo by chance 30 years later. I was actually marooned there. But when I visited it I felt as though I’d come to a magical place because it was the place of my childhood dream.